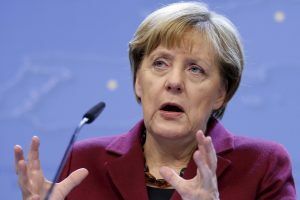 Any deal with Libya to control migration similar to that reached with Turkey cannot be signed until a semblance of political stability has returned to the country, German Chancellor Angela Merkel said today. Despite this, she said it was critical the international community work with Libya given that last year more than 4000 migrants died trying to cross the Mediterranean from Libya to Italy. Last March the EU offered Turkey money and visa-free travel in order to clamp down on local people-smugglers and stem the tide of migrants from western Turkey to nearby Greek islands. On Wednesday the European commission rejected a similar deal with Libya proposed by Malta which currently holds the EU presidency. Foreign policy head, Federica Mogherini said the situations in Turkey and Libya were “completely different” and voiced her concern at making economic bargains. However she did announce €200 million of funding to help prevent migration from Libya which includes €3.2m to bolster the current EU training programme for the Libyan Coastguard as part of Operation Sophia. The International Organisation for Migration (IOM) reported yesterday that 3,829 migrants had entered Europe by sea in 2017, with 246 fatalities.